On-site messages are becoming an increasingly familiar part of the online shopping experience. After fighting the competition to attract visitors to their sites, online retailers are becoming smarter about how they can make sure these shoppers stick around and buy. Whether using on-site messages to make an announcement, collect more email addresses, or provide customer service, their intent is to enhance the customer experience online and turn more visitors into customers. 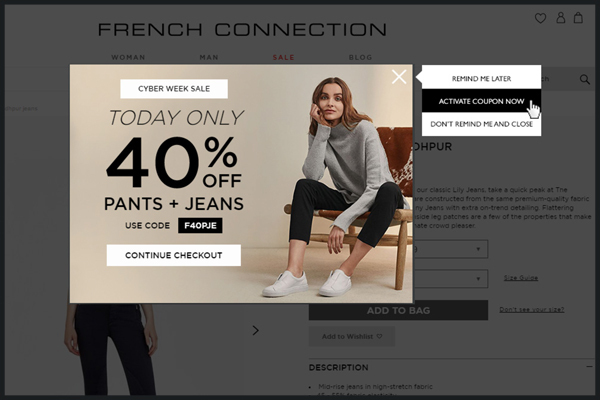 Check out these seven examples of on-site displays that increase online conversions. I’m sure just the thought of having to assemble IKEA furniture is enough to make some visitors want to abandon the purchase! 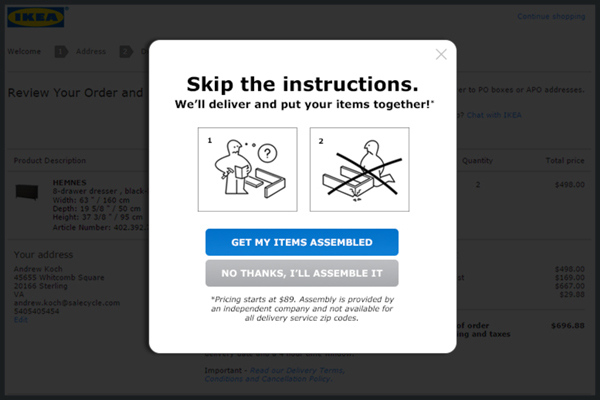 Identifying this as the perfect up-sell opportunity, IKEA asks customers just before payment if they’d like to have their items assembled after delivery. With a cute illustration of the dreaded instructions, alluding to what may come next, IKEA subtly highlights to their customers that the additional expense may actually take some of the pain of the purchase away. I’m sure this handy on-site message can be credited for saving a few relationships too! There is nothing like a looming deadline to spur people into action. And when it comes to Mother’s Day, that’s really one you can’t afford to miss. Displaying an on-site message with a countdown timer at the point a visitor either shows intent to leave or has been inactive for a period is a great way to pull them back in. Counting down to the end of a sale, a discount or free shipping adds a helpful dose of urgency to speed up a visitor’s decision process. 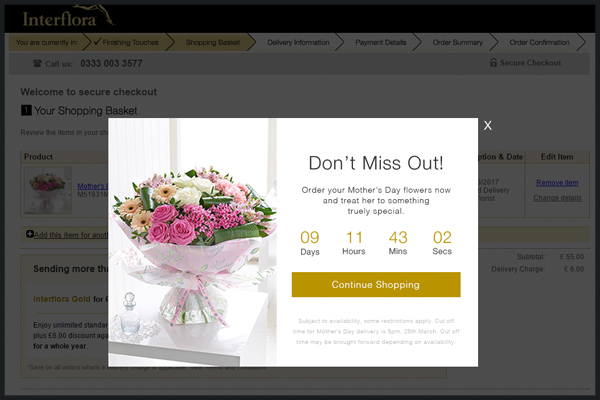 Interflora have done just that, showing the order deadline for delivery on Mother’s Day. This encourages advance orders as visitors don’t want to miss out during this high demand period. On-site messages are not always about driving a conversion at the point of display. TripAdvisor used this message on exit intent to help change the perception of who they were as a company. So many travelers got accustomed to relying on them for reviews, then leaving to another known booking engine to make the purchase. 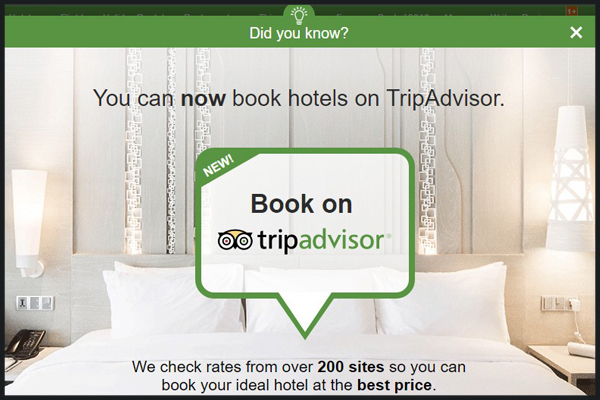 When TripAdvisor became a booking platform of their own, they needed visitors to know about it. TripAdvisor played on this abandonment-to-book behavior, and showed an informative ‘Did you know?’ message on exit. The inclusion of a price guarantee was another reminder to show there was really no reason to look elsewhere. The online booking process can be stressful, with a lot of time put into planning the perfect trip. Weighing up the different options available, and ensuring you have all of the information required can be time-consuming, especially when there are multiple travelers involved. 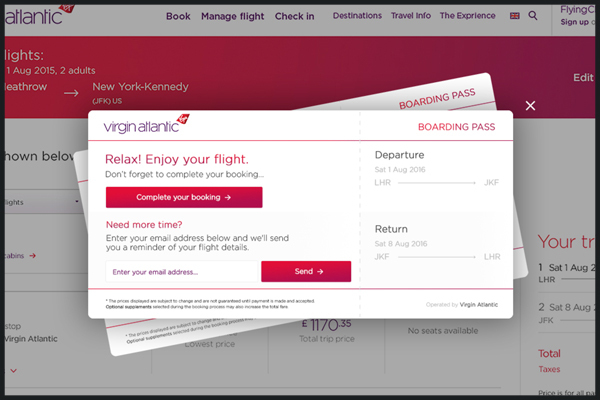 Virgin Atlantic address this issue by displaying a message giving visitors the option to save the itinerary they’ve created with a handy route back to purchase when they’re ready. Just input your email address and they will send you a full copy. The clever design also shows two tickets when multiple travelers have been selected, making a nice break from the usual box display. No thanks? Not so fast. While discount codes are a tricky one to champion for regular use, they can be effective in on-site messages when they come as part of a larger or limited time sale. French Connection’s exit intent message displays a reminder of a daily sale on the items that are being abandoned. The discount code is displayed to incentivize the visitor to continue with their purchase, but if they close the window they are presented in three options for how to proceed; would they like to save the voucher code, use it now, or simply leave? Showing these options is a way of checking if the intent to leave was genuine, and gives the user a second chance to consider the offer. Booking.com are anything but subtle when it comes to their urgency messaging. 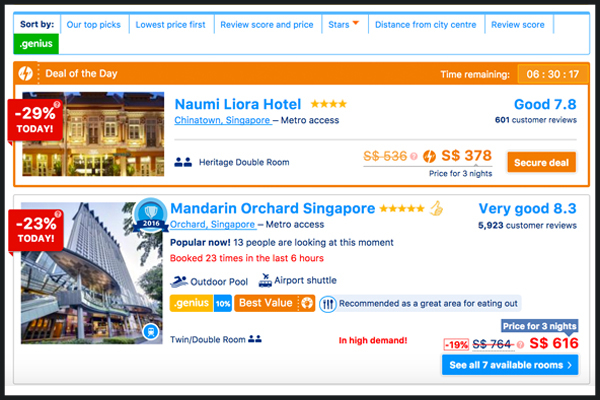 Countdown timers, live trends, social proof, price guarantees.. Booking.com have covered it all. All of these tactics play on typical consumer behavior, encouraging visitors to make faster purchase decisions, for fear of missing out on the best deal. Without this, we would be inclined to shop around, take our time, or put it off altogether. Adding an element of scarcity, playing on popularity, and displaying guarantees all put the customer’s mind at ease, stop the need for shopping around and compel us to buy. Shoppers are constantly looking for validation of their choices. Consumer reviews and ratings can give them the confidence that they’ve selected something they’ll enjoy, and motivate them to buy. 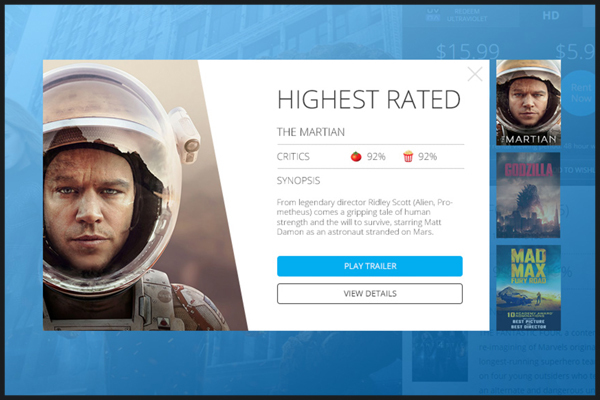 CinemaNow incorporated reviews into their on-site message, along with the option to watch the trailer. This took away the need for the visitor to go elsewhere, with all of the information they needed in one place. With 77% of customers looking to reviews before making a purchase, it makes sense to have these on hand when they need them. PREMIUM AUTOMATED Dropship wooden items mega store – fully loaded with hundreds of ready-to-sell products with 25%-120% margins in profit, with a valuable great domain name! You have a great chance to purchase this site earlier than others can do. If you are interested in this type of business, do not hesitate to write us your proposals regarding the preferred price and believe we can find a compromise with you! This is your best chance to own a 100% Done-For-You Online Business. On sale Turn Key Business: wooden novelty items and accessories Huge Mega Store with hundreds of products. Grab this beautiful custom designed Fully Automated Dropshipping e-commerce business with a domain name that is descriptive and easy to remember. No requires technical skills, No huge investments, No inventory and No stocks. The small gift and novelty item industry is a $21 billion a year industry that has shown no signs of slowing. Introducing https://thewoods.store a modern e-commerce dropshipping website for selling popular wooden specialty items and accessories, with hundreds of products at competitive prices. Completed with Fabulous attractive Domain Name (includes popular keywords), Dropship Trade Supply Chain and High Margin Product Inventory! Site-oriented for sales products and delivery to any state or province directly from the suppliers. The site is focused delivery to any country in the world. Dropshipping is a form of eCommerce in which you sell products that you never see or touch. You only purchase these items (at a low cost) after your customer has already paid you (at your marked up price). You don’t have to worry about fulfillment or inventory issues at all!. Drop shipping makes it amazingly easy to get started selling online. You don’t need to invest heavily in inventory, yet you can still offer thousands of items to your customers. You can manage the Dropshipping business from any corner of Our Planet! It does not matter whether you are American or live anywhere in the world. You can be a citizen of any country! Not having to worry about fulfillment is incredibly convenient. Successfully launching and growing an e-commerce business takes a lot of work, especially if you have limited resources. Not having to worry about fulfillment is incredibly convenient. A drop shipping business can be run from just about anywhere with an internet connection. As long as you can communicate with suppliers and customers easily, you can run. This is a tried and tested e-commerce model. Plenty of online stores, use drop shipping to offer a wider selection of products to their customers. But drop shipping does provide an easy way to get started and the ability to leverage other people’s capital without having to invest thousands of your own. When promoted and managed correctly, it can form the foundation of your own successful online business. Wish you to become your own boss and work less, and more to give your time for joy with your family or friends and more to travel the world ??? If so, imagine a business that requires a small amount of time, because it is fully automated and in addition, brings a daily income. You do not need to make any global financial investments and keep warehouses or staff of office staff. The costs of maintaining the site and drop shipping partner you will only pay the equivalent of 1-2 sales of products from your site. The rest of the sales will bring you a net profit. You can become absolutely independent both in time and in the place of your stay or residence. The site and the registration of orders (or rather, the control of the whole process), you can borrow from anywhere in the world, while spending only a maximum of 1 to 3 hour a day. If you want all this and without any huge investments, then we offer you a ready-made and debugged business.Turn Key business in very attractive growing niche! https://thewoods.store is a beautifully designed, modern online store for wooden goods – complete with an impressive and stunning a variety of watches, cases, jewelry and USB sticks goods and supplies. Thanks to the brilliant domain name, professionally design, branding, high-resolution images and hundreds of profitable products, here lies the foundation for a successful long-term business! This is a winning site and a fully customized primary retailer. With hundreds of products in the store, this site boasts an incredible assortment that is comprehensive and authoritative. Products also very complimentary and easy to mix and match. Undoubtedly, many customers will add more than one product and with such an excellent range of products in the store, there is no doubt that many customers will almost certainly come back for more. But the best part is that you do not need to buy any goods or store any inventory to run this business, because this site has already created and implemented the Dropship supply chain for all products in the store, so all your orders are delivered directly to your customers, effectively and transparently. When the order is received through this site, you simply order products from the vendor, in just a few clicks the system will automatically fill in your customers address, and they will be delivered directly to your client, efficiently and transparently. It is worth noting that the goods will be delivered to customers in anonymous postal packaging that is uncommonly convenient for customers! You earn money from a simple buying process on wholesale and retail sales, in other words, you earn money in the margins. And the margin for this site is very profitable 25%-100%, roughly speaking, on the whole range. This is a high-quality professional, profitable, online business. Nevertheless, this is a business that you can perform with minimal effort from your laptop or smartphone, even because of the comfort of your home chair – from anywhere in the world. When the order is received through the website, you simply order products from the vendor, with just a few clicks the system will automatically provide them with the delivery address of your customers, and they will be delivered directly to your customer. It’s really that simple! Our site accepts payments from customers through credit cards and also through or from PayPal accounts. The processing of all credit cards is carried out through Stripe. Therefore, the new site owner will need to have his own PayPal and Stripe account to receive payments through the site, as everyone Once you receive the order, the money goes directly to your to your account. You can then transfer funds to your bank account. In addition, the site has integrated Daily Products Sync, which provides you with an opportunity in automatic mode (usually once a day) synchronize the inventory of the website in accordance with the supplier’s own resources, so the number of products on the website is updated automatically. You can even add more products from other suppliers if you require it. Unlimited opportunities for expanding the site in the range, new categories of products! You can increase the number of goods to thousand without any problems. Our site easily and simply allows you to expand the range, and filling the site with new products with high-quality products will happen in just a few mouse clicks and in a few hours. Most importantly, you just need to expose your new margin and during synchronization, the store will be filled with a new assortment. Everything is easy for you to do and in fully automatic mode. The site can have Newsletters service (also with auto subscribe function during checkout process) which allow you attract visitors over and over to your site with promotion and discounts. Once per week you can send newsletters and get back your buyers. Given the volume of products the site is carefully designed to increase the exposure of its entire assortment – optimization, category hierarchies, pages, messages, navigation and content have been strategically optimized for maximum impact, to increase visibility, sales, revenue, and purchases. Broad and limitless opportunities to attract customers to your site. Embedded already in the site of additional programs to attract visitors from social networks, including easily share to social networks such as Pinterest Twitter Google plus Facebook. Managing this site on a daily basis is a light breeze. Everything was created to ensure that the launch of the site in the long term was as simple and effective as possible. It does not require any preliminary experience. Order processing process -> Customers can browse the site and add products to the shopping cart. Then they can go to Checkout, where they can pay for the order with a credit/debit card or PayPal. As soon as the order is made and payment is made, you will receive an email confirming the order from the site and confirmation of payment. Simultaneously, in the administrative panel of the site, you will see information about the order made and also receive information about the payment. Processing orders -> You just go to the site of the vendors Dropshiper and order the necessary products, providing the address of the customers as an address delivery. ( this information will be auto-filled by the software) Then the supplier will deliver the goods, transparently and promptly, directly to your client. The products are shipped directly to your customer without any mention of drop shipper’s company on the package and without any invoices and promotion materials. This is what we refer to as blind drop shipping with discreet shipping. That’s all. You get PROFIT! At the moment the site is set up to provide free shipping on all orders. This can be edited at any time if required. If you received just one order in the amount of $50 per day, with set a margin of 25%-50%, you will make a profit of about 12.5-25$ per day or $9,000 per year. Of course, the new owner of this business should look at making at least 10 orders in a day, and with hundreds of products, it’s easy enough to do and multiply the number of orders. Only imagine that you can receive 5-10 orders in a day or more. Even with a minimum of 5 orders per day, your annual profit will already be $45,000/year. If you are looking for an online dropship business opportunity, do not look any further. https://thewoods.store is a highly realistic, highly profitable, high-priority Internet brand with a powerful e-commerce drop shipping system and beautifully designed megastore with hundreds of modern products, with a fully-fledged system and the chain of sale and delivery of goods, ensuring the guaranteed fulfillment of your orders. The site is based on the familiar WordPress Woocommerce platform with a minimal cost. WordPress Woocommerce is a reliable and familiar platform with no shortage of information and add-on. Domain name thewoods.store transfer to your own Go daddy account. Fully Automated Website on WordPress Woocommerce platform Blog solution for write reviews and publish recent news. Fully responsive and mobile friendly theme. free transferring of the website to your (Lennox cPanel) hosting service or hosted on current service for a small hosting fee. I have full 100% satisfied client list with hundreds of sold websites for 12 years and my feedbacks shows it. Buy sites from I Yee Sales and Get all Benefits and Bonuses and Guarantees plus FREE technical support (Guaranteed). Please feel free to look me up. We run a successful web design and development business iyeesales.com and have been around for over a decade. Please do not hesitate to ask me any questions here or by PM. Thanks for looking and bidding. One of the obvious concerns when developing an e-commerce website is the design to achieve a high conversion rate. With thousands of split tests and years of experience I Yee Sales, can guide you throughout the process. Our high converting professional modern designs are geared towards your audience and ease of use. The website must be easy to navigate for your visitors, and simple to manage by the store owner in order to be successful. Training and after website builds support is always offered to our clients. We will design the e-commerce store for your specialty shop, single item or large department store. All of our websites are fully responsive, adapting to all screen sizes (desktop, tablet and smart phone) and are optimized for search engines. We don’t just build a website we build a business. Your customers will enjoy the one-page checkout. The ability to share their cart on their favorite social platforms. Personal account login, with the ability to reorder or look at the shipping status of their items. Product filters and search functions to quickly navigate through your e-commerce store. The highest security standards possible tested by an independent firm. Extensive reporting with a bird’s eye view or a complete drill down. Configurable tax and shipping options. Complete store management easily, upload unlimited products. Complete control over related products and up sales. Automatic email confirmation of order. Complete control over coupons and discounts for promotional purposes. Affiliate program can be integrated into the e-commerce site. CSV file imports and exports products easily and quickly. When getting a custom forum site built, there are many things to consider beyond color and design. A smoothly functioning forum site is one which has been thought out carefully: how to associate the different groups of subjects and how to encourage engagement. What permissions and features to give your users and an easy way to moderate the forum is also a must. All of these can be set up in an independent forum site. It can also be integrated into a WordPress or Joomla! website so that all of your existing members can now participate in your forum. All of the forms are SEO friendly, search engine optimized URLs and XLM maps, so all search engines have an easy time indexing and understanding the user content being generated. Membership sites can take on many roles, proper planning can not only save you money but make you money. Proper navigation for different memberships, blocking only certain content for different levels of membership. Only letting certain members move to another level after a certain amount of time. Perhaps blocking downloads and having one-time payments for specials. Permitting members to only move on, once a test has been passed. Collecting monthly fees on autopilot and also automatically adding content, makes the job of owning a membership site so much easier and profitable. We have had the opportunity to build many successful membership sites, with all types of combinations of permissions for members and membership levels. No matter if it is a free membership site or an exclusive highly monetized membership website, the care and expertise to protect your content and still give an enjoyable and rewarding experience for you and your customer is our priority. We can also provide your members with a fully customized dashboard allowing them to see all their personal accessible content and information, a place to see all of their favourite posts, all of their uploads and downloadable content available only to them. Call us today for a free consultation. The value you will get by speaking to one of our experts will be yours and will benefit you no matter what the outcome.